Bangkok is one of the most exciting cities in the world for travelers. Unfortunately, that also means that Bangkok is quite busy and often touristy. While most visitors will want to see the major sights in Bangkok, such as the Grand Palace, it’s nice to be able to see a different side to the city. In fact, we’ve found that some of these more unique experiences tend to be the most memorable! So we’ve put together a short list of some of the more unique things to do in Bangkok. When traveling, connecting with locals is one of the most memorable (and fun) aspects of our travels. Locals are not only full of tips and helpful information, but they can give you true insight into their hometown and help you to participate. It’s more fun whenever you can feel apart of the experience, rather than an outsider just peering into another world. For this reason, we recommend linking up with a local guide. And for visitors to Thailand (and other destinations), WithLocals.com is a super cool resource! In Bangkok there are more than 50 options for unique experiences through WithLocals, anything from day tours around town, visiting floating markets (away from the mass of tourists), bike tours, local neighborhoods, and even cooking classes! The locals can shows you all kinds of fun things to do in Bangkok – and give you a much more unique and authentic experience. What an awesome way to have a unique experience in Bangkok, and make some new friends! Speaking of cooking classes…who doesn’t love food? Especially Thai food! I remember our first visit to Thailand, I was just in heaven with the food. The only problem was that when I came home after the trip, I was craving this incredible taste that I couldn’t be found anywhere back at home (believe me…I looked!). So during our next visit, we made sure to take a cooking class in Thailand. It was a great way to spend the day. Rather than being out in the heat, we were inside chatting with other travelers from all over the world, and getting to know our Thai cooking teacher. Downing a few drinks, chatting about food and fun around town, it was a really awesome way to spend the day. And not only were we rewarded with a wonderful (and huge) meal that we cooked ourselves, but we got to keep our recipe book and notes from the experience. So now, I am more likely to be able to recreate these tasty dishes at home! There are many cooking schools all over Bangkok, so it really isn’t hard to find them. The difficult part will be choosing which one. But if you are also interested in a local experience, you can also book a cooking class online too. There are many different cooking classes in Bangkok to choose from! There are many famous parts of Bangkok that are popular for tourists to stay, such as the Koh San Road area. However, that area is incredibly touristy (and overpriced) and we’ve never really had a good experience there. So if you are looking for a different experience, how about staying in a local Thai neighborhood instead? One of the best ways to find a local neighborhood to stay in while in Bangkok is by using Airbnb. We’re fans of Airbnb because it makes it easy to connect with locals and have more of a homestay kind of experience. During one of our visits to Bangkok, we stayed with Mac and Noi in their home. An American expat with a Thai wife, they were so warm and friendly! They gave us so much advice and insight into the local area. They even recommended specific things to do in Bangkok, and took us around themselves. We really loved exploring their local neighborhood – relaxing at the restaurants and enjoying the slow pace of daily Thai life. It was such a difference from being in the tourist center. Yet, it was only a 5 minute walk to the bus and 10 minutes to the river or the train. Our Airbnb host showing us his favorite lunch spot in his local Thai neighborhood – away from tourists – cheap, easy…and so friendly! If you are looking for some inner peace and relaxation, then one of the things to do in Bangkok that you might enjoy is taking a meditation class. There are many Buddhist monasteries and meditation centers all around Bangkok. While most of them are in Thai, you can find a few centers who provide instruction in English. Buddhist monasteries and Wats in Bangkok are welcoming to visitors, and you may even just be able to pop in for a visit and chat with a local monk. We even had the opportunity to chat with a monk at a monastery in Bangkok, and it was a truly memorable experience! Be prepared to make a small donation out of respect. Your generosity is much appreciated. For an exciting and truly local experience, then definitely check out Thailand’s national sport of Muay Thai! A type of kickboxing, this is a treasured sport in Thailand. And while it may seem violent on the outside, it is actually a deeply spiritual and meaningful sport – as you will see by the rituals and praying before each fight. We were lucky enough to witness a Muay Thai fight while staying in Koh Samui, but visitors in Bangkok have even more opportunities to see a fight. There are numerous stadiums around town, including the big Lumpini and Ratchadamnoen in central Bangkok. The bigger stadiums are a little pricey, and can still sell out. However, there are many other small areas and schools where you can see fighters sparring with each other; although, it may be more difficult to find these as a tourist. Connecting with a local guide or just asking around is a great way to find out where and when you can check out a fight for cheap. And if you are felling a bit more adventurous, then why not take an actual Muay Thai class and learn a bit more about this sport…and get a great workout at the same time! Over the years, we’ve discovered that it tends to be these little, unique experiences on the road that we remember the most. 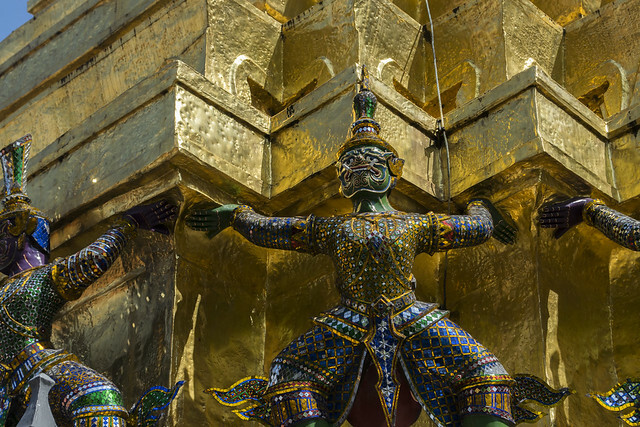 While in Bangkok, it’s understandable that you want to check out the main tourist sights such as the Wats and the Grand Palace. But taking the time to research some off the beaten path activities, staying in local neighborhoods and connecting with locals will undoubtedly give you a more memorable experience. Lastly, there are so many things to do in Bangkok that you may have a full itinerary (click here to download a sample Thailand Itinerary). Rushing from tourist site to tourist site doesn’t give you the time to reflect and appreciate the experience. So be sure to build in plenty of time in your itinerary to enjoy these local experiences. We promise they will be the things that you remember most. Did you find this useful? Pin It on your Pinterest Boards and make sure to Follow Our Boards too! Wonderful Liz – so glad to hear you found it helpful!